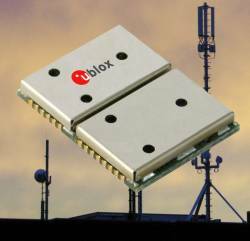 u-blox has released its 8 module series that addresses user needs for power-sensitive operation. A derivative of the u-blox 8 GPS/GLONASS receiver platform launched in January, the module is related to the u-blox M8 platform that targets applications where navigation performance and high accuracy are paramount. The new u-blox 8 modules EVA-8M, NEO-8Q, MAX-8Q and MAX-8C will succeed their u-blox 7 predecessors, with which they are pin compatible. According to the company, the u-blox 8 tracking sensitivity has been increased by four decibels above that of the 7 series and is now –166 dBm. New features include geofencing, advanced anti-spoofing, and anti-jamming functions. Power consumption is down by 13 percent, making the modules suitable for applications such as asset tracking, telematics, sports, and wearables, u-blox says. Sampling quantities of the u-blox 8 module portfolio will be available in May/June 2016. The modules will be available in volumes in August 2016.